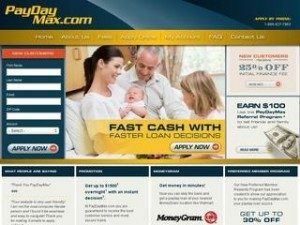 PayDay Max Review: Is This The Best You Can Do? There are many reasons why you may need a quick payday loan. There are many places you can go for a quick loan, but how do you know which one to choose? It is very important to look at the types of loan services that are available and not only make sure these services have what you need but also that you are eligible for their services. Looking at a PayDayMax review can help you find out if you can afford to risk a high risk loan. Most payday loan services will have a few features in common. Of course, cash advances are a common feature of these services. They all typically have overnight deposit and direct deposit to your account available. Many also have electronic transfer as a means of repayment if you need to send your payment in a quick and secure way. Credit approval is also needed for many of these services as well. So what makes PayDayMax different? This service is one that does not approve loans from those who already have payday loans or outstanding cash advances from other services. New customers also get a lower fee than existing customers. Also, lots of services that operate in all 50 states, but PayDayMax excludes nine states. Even though the entire process is handled electronically, you are required to fax either a cancelled paycheck or a recent bank statement in order to verify your income. Of course, there are also other features that PayDayMax has in common with other services. The typical loan term is 7 to 14 days. If you need a longer term loan such as a full month (31 days), you will have to pay higher fees. You can also borrow up to $1000, which is rather standard in most cases. Also, if you extend your loan, you will have to pay additional fees. In most cases for payday loans, you can find out instantly if you are approved. Once you are approved for your loan, the process is rather simple. You receive funds in your bank account. On your next payday, PayDayMax automatically takes payment from your account via a debit. If you end up having to make multiple extensions, you may have to make a payment on the principle of your loan even if you are granted the extension. Although the website appears very user friendly and uncluttered, you should be careful about using the site. The connection you use may not be encrypted, which means an unauthorized party could read your information. Also, the site does not supply ownership information, which does not inspire much confidence if you like to be careful about your sources. Furthermore, this lender is based out of Anguilla, an island of the British West Indies. If you have any concerns about security, this lender may not be the best for you. Fees and interest rates are also very important to consider when you need a payday loan. While the fees for PayDayMax appear to be lower than others, they can increase depending upon the length of your loan. For instance, standard loans from 7 to 14 days for new customer can range from around $9 to $13.96 per $100, but the standard fee is usually $18.62 per $100. 31-day loans may be more than $37 per $100. So the APR rate would be around 431.79% for new customer and 616.85% for existing customer. You may also be a bit disappointed with customer service options for PayDayMax. While the lender claims to be available 24 hours a day for six days a week (Monday through Saturday), you can only reach customer service via phone. There is no email contact and the physical address given for correspondence is located in British Columbia. The FAQ section may not be as useful as you need and you may feel it is being misleading. Although it appears to be an easy way to get a quick loan, PayDayMax may not be the best option when you want to get a secure loan. Perhaps the best feature of this particular loan is the option to extend as many times as you need, but in the long run, this makes the loan much costlier. It would be in your best interest to check out as many options as possible before making a final decision.